A series of sermons on heaven and hell by Christopher Love. Today Christopher Love is not very well known. But in spite of his obscurity, this delightful volume which has been recently reprinted is of utmost importance in the life of the Christian. The two works are excellent. 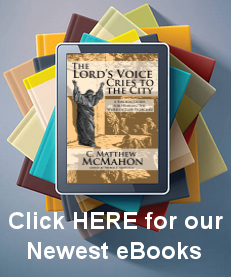 Heaven’s Glory is covered in 10 sermons. Hell’s Terror is covered in 7 sermons. Jonathan Edwards kept a copy of Love’s works due to the ever graphic and important work he did in preaching through the doctrine of hell. The works are nothing short of phenomenal. They are simply a series of sermons on these importnat topics which cover the topic in detail, and in many ways not previously ventured or thought of before. In covering the topic of heaven, Love shows wherein the glory of it may consist for the Christian. Why should the Christian hope towards heaven? What may be expected there? What is Christ’s role there and how will the Christian interact with Him before the throne? What does it mean that Christ is glorious, and how will his appearing usher in with great glory the heavenly state? These questions and more are treated in these sermons. Hell is topic men tend to avoid. They have an aversion, not to sweep it under the rug, but rather to throw it out of the house all together. Here Love tackles the subject with great insight, historical accuracy and penetrating application. It is a most dreadful thing to fall into the hands of a holy God. God will not allow the unrighteous to go unpunished. Love treats the topic of hell in balance with his treatment of heaven. He could not, in good conscience, speak on heaven for the saint without speaking on hell for the sinner.